"You get tests in life and it's how you bounce back." Manager Gary Rowett did his best to remain stoic after his Derby County side were beaten in their play-off semi-final by Fulham - the Rams' third failure at this stage in six seasons. 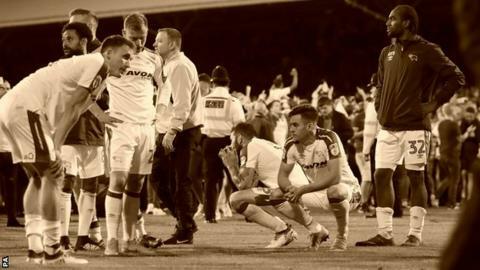 And history shows it will not be easy for Derby to end up in the top six again next term, because in the seasons following their 2013-14 and 2015-16 play-off defeats, the team finished eighth and ninth. So is the post-play-off dip a common problem for teams? In order to find out, we studied 30 years of the English Football League knockout format, which began in the 1986-87 season. We also spoke to manager Danny Wilson, who has experienced the highs and lows of play-offs, and a sports psychologist to understand why some teams find it difficult to pick themselves up. Up to and including the 2016-17 season, the hankies have come out for 252 teams who have had their dreams shattered at the play-off stage. Of the 252 teams, 142 (56.3%) did worse the following season, with 14 relegated. 51 reached the play-offs again (20.2%). Another 15 were promoted via the play-offs. 44 teams achieved automatic promotion. In total, 23.4% bounced back to win promotion the following season. 16 of the 93 beaten finalists (17%) have gone up automatically the following season. Reading (in 2002 and 2012) are the only team to achieve the feat twice. Just under a third (29%) have reached the play-offs again the following season. Exeter City, who play Coventry in Monday's League Two final, were the only one of last season's three beaten finalists to reach the play-offs this season. 27 (28%) have finished bottom half of the table but avoided relegation, while eight clubs (9%) have suffered the ignominy of going from the brink of promotion to relegation. Leyton Orient (2015) were the last team to go from Wembley one May to desolation the next. So almost 60% of those who failed to achieve promotion via the play-offs have found it difficult to replicate that feat in the subsequent campaign. Why is that? Michael Caulfield, a sports psychologist who has worked with league clubs, suggested players might find it hard to recharge after what they considered a season of "failure". He told BBC Sport: "The sheer sense of disappointment and then thinking all you need to do as a team is turn up and try again is an issue. "For a new challenge you will need renewed energy from those who haven't been affected by the past disappointment - it's a very delicate social balance clubs play with here. "It is important for players to primarily recognise and recall why they have had such a good season, because they might not see that they have done so well as they will regard it as a failure. "I would suggest a complete and utter break from that thinking about what went wrong - professionals often get so emotionally attached to football they can end up overanalysing it." Danny Wilson has twice suffered play-off final heartache as a manager - his Swindon Town side fell to a 1-0 defeat by Millwall in the 2010 League One final before his Sheffield United team were beaten by Huddersfield Town on penalties in 2012. He told BBC Sport there were many factors - including having the right state of mind - which dictated how a team would react. "I think, more than anything, confidence is key," he said. "It also depends on the strength of the squad. You might have to look at player recruitment in the summer - that will have some bearing as to where you are going to finish the season after. "It is also a big test in pre-season to make sure everyone comes back in the right frame of mind, or certainly starts in the right frame of mind after that first week or so. "It is about trying to pick the players up."